Yes, a musician needs a website to represent themselves and their music on the Web. The same goes for music producers. You don't however want a website which simply acts as a brochure, online store or display case for you and your music. That would be only a bit better than not having a web site at all. We're not in the 1990's any more so the Web has come a long way and a website needs to be and do more than just be a digital brochure. ... a platform which stands at the center of your music web presence and ties together all your activities on the Web. You can imagine your musician website as the proverbial Rome all roads need to lead back to. I've written before about how to use your official artist site in relation to your overall web presence. ... a meeting-ground were you and your tribe can connect, communicate and create a tribal culture. You can and should add fresh music, artwork, lyrics, photos, videos and blog posts to attract the attention of potential supporters and keep the existing tribe happy. You also want to make it easy for your tribe to connect and communicate with each other and share your music and web site on other web sites. This can be done on Facebook but if you can create a busy forum on your own site you'll have more control of the content. ... a web asset which creates exposure, equity and income for you. 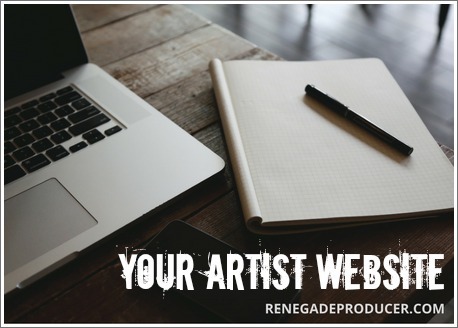 Your web site will also create equity for you as it allows you to get more exposure and grow a list of e-mail addresses of supporters who want to hear from you, which in the long run becomes one of your most valuable assets as a musician or producer. Yes, social media has become extremely important. You must grow your Soundcloud, Twitter, Instagram or Facebook followings. Most professional producers and artists however also have their own websites which allows them to implement membership programs and build mailing lists. This is vital as your own website and mailing subscribers are more valuable since you own the list and traffic and this makes you less dependent on the whims and fancies of the large social media platforms. Grow your social media following on the platforms that work for you but make sure you direct the attention back to your own website and projects to increase your website traffic and grow your mailing list. The above are some of the more important reasons why every musician and producer needs a quality website. In the next article you'll discover the 20% you need to know about good music website design. Know and beat your #1 music production enemy. Get the right perspective - the perspective that is conducive to productivity in the studio. Find your flow and increase your output to the level where you know it could be. Feel fantastic when you start to crush it in your home studio on a regular basis! Don't miss out on your chance to level-up your studio workflow and output. Get ProducerCode: Studio Flow, pour a glass or mug of your beverage of choice and start to upgrade your music production process straight away. See you on the other side!